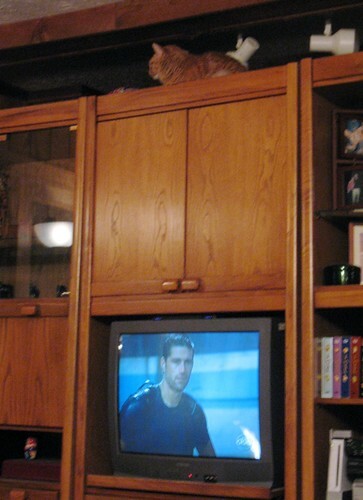 A kitty watches us watching Lost. Daiku and I are fanatical about Lost. He introduced the show to me in season 1 and I've been hooked since. Back then, I lived in California while he lived here and so we would always discuss the show on the phone after it aired. Getting to watch the show together was one of the fringe benefits of me actually getting to move back to the east coast! Flash-forward a few years. Last December, at the holiday party at Daiku's school, we were talking to a friend of ours who had just moved here from California. She mentioned that she and her husband are big Lost fans too. It just seemed natural that we would get together to watch the new season once it started airing. Two other friends of ours looked at us like we were crazy- they wanted to know what this show was and why we seemed so crazy about it. Well, this seemed like the perfect opportunity to bring two more people to the dark side! And so, starting with the first episode of this season in February, the 6 of us got together every Saturday night for food, drinks, and fun while watching Lost. I have to say, it has been the funnest semester, and an awesome way to watch the show. Sure, it meant a nail-biting wait between when the episode aired and when we got to see it, but it was so worth it! Through bad weather and dark nights, through school holidays and exams, through teaching highs and lows and travel and family obligations, we managed to watch almost every episode of this crazy show together, as a group. One of the coolest things for me was that our friends made huge efforts to make sure that there was always vegan food for me to eat at their houses. In return, I made sure to cook the most delicious foods I could, so that they'd be happy and satisfied with the vegan offerings at hand. The result? 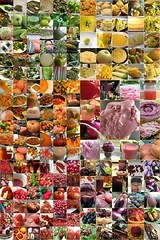 Lost of delicious food! homemade pizza with tons of veggie toppings at R. & D.'s house. 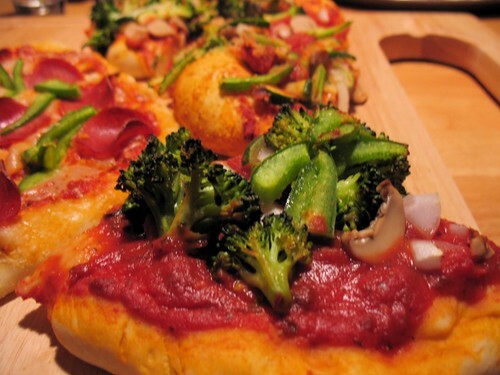 I love broccoli on pizza, don't you? 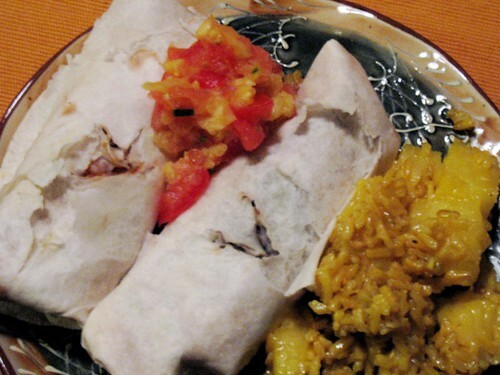 an entire plate of vegan goodness at H. & E.'s house: black bean and sweet potato wraps, mango salsa, and pineapple rice. Wow, these were good! Notice how the wraps have a "v" baked into them, to made sure we could pick out which were vegan vs. which had dairy cheese in them- a thoughtful touch. I believe that these were all Moosewood cookbook recipes, and they were so good. 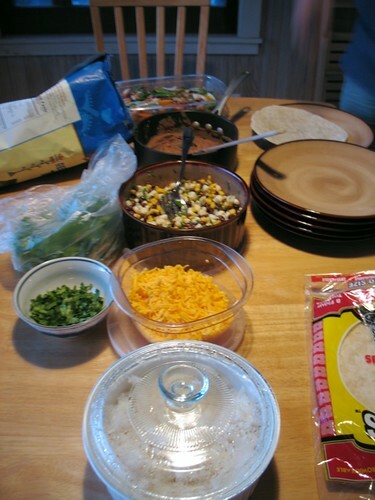 Here was an awesome make-your-own burrito station at R. & D.'s house- rice, beans, salsa, tortillas and tortilla chips, cilantro... all the goodies. 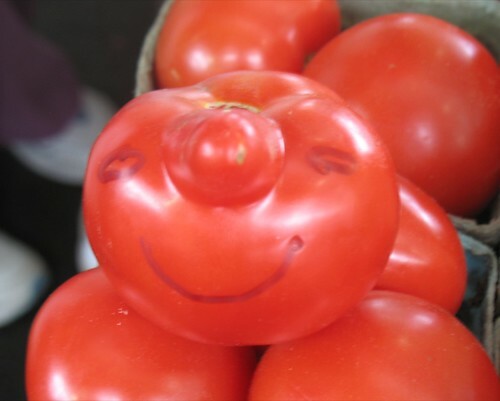 I especially liked R.'s "no tomato salsa" (no tomatoes here in Syracuse in the winter!) 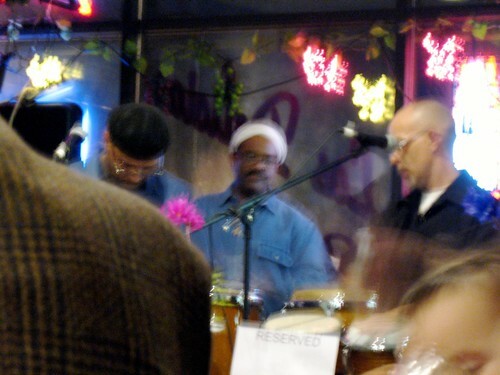 with hominy. I love the toothsome texture and satisfying flavor of hominy and it went well with all the other burrito ingredients on hand. 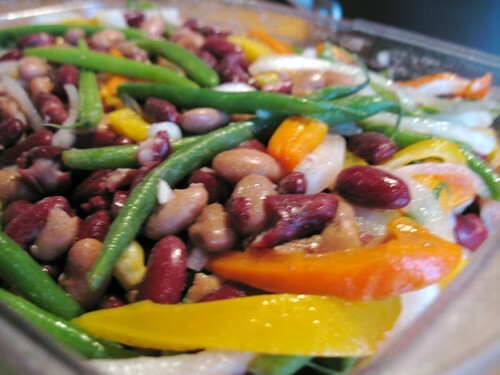 H. is the master of salads- here was a colorful and tangy mixed bean salad she made. 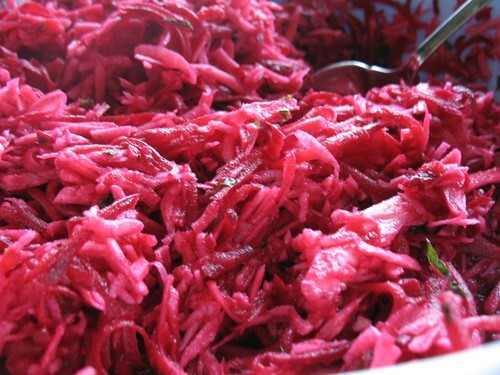 And here's the striking beet and parsnip slaw that she made, from Veganomicon! This salad was so good- we were all oooohing and aaaahing at the bright pink color and amazing flavor. Who know you could eat raw parsnips? Yum! 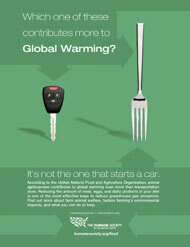 Here's one of our contributions. Daiku made this black-bean chili with cornbread topping on a particularly icy night. 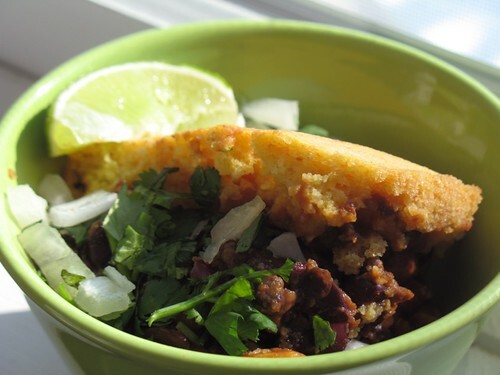 The spicy chili, comforting cornbread, and toppings (onion, cilantro, lime) really hit the spot on that snowy night. But we mainly contributed desserts. 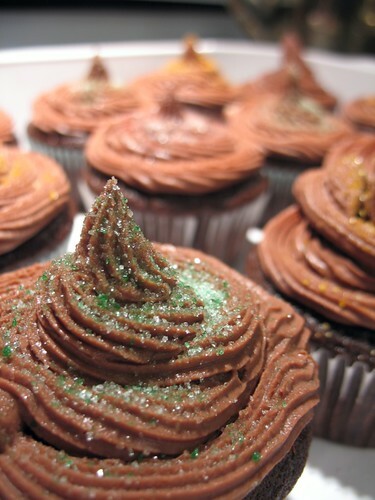 Here you have some chocolate cupcakes with chocolate mousse topping. 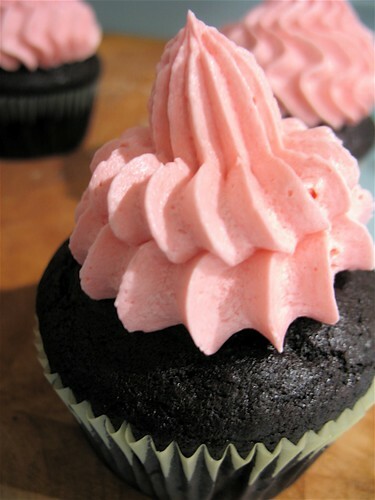 (That chocolate mousse is my favorite frosting recipe from Vegan Cupcakes Take Over the World. It is so flavorful, and yet so light). Here we have a Lost cake! 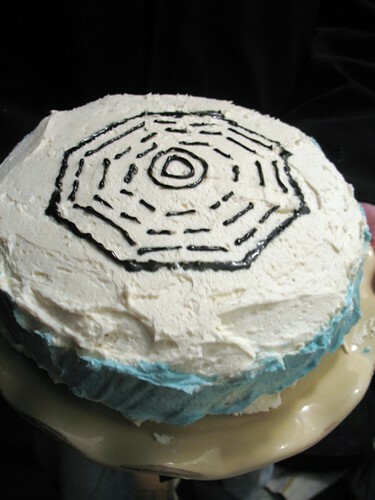 The design on the top is my clumsy rendering of the Dharma Initiative logo, and the blue frosting on the sides is supposed to represent the ocean. Ok, I'm not the world's best decorator! But, what the cake lacked in looks, it made up for in flavor. 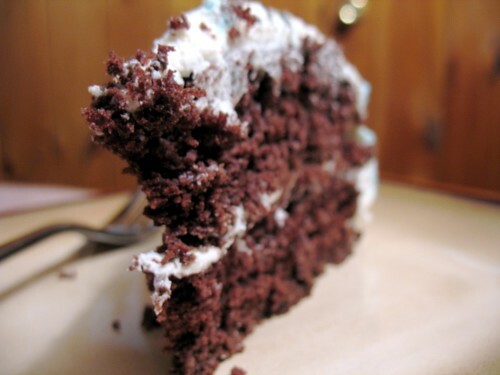 I made Kittee's red velvet kake recipe- and it's a winner! It has a unique flavor and all our friends loved it. Of course, one can't live on cake alone. (Well, one could but perhaps shouldn't...). 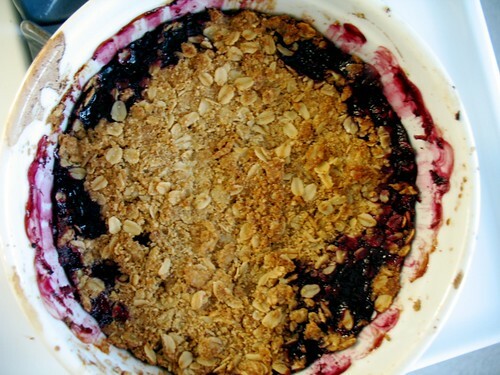 Daiku made this fruit crisp for one of our get-togethers, using his favorite apple-cherry crisp recipe from Whole Foods. 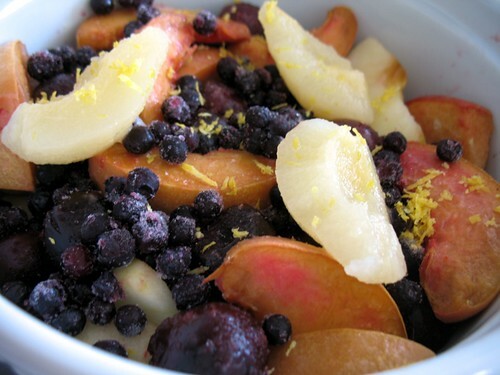 However, since this was the middle of winter, we had to improvise with the fruit a little bit, so we threw in what we had in the freezer- we ended up using frozen apples, peaches, blueberries, raspberries and cherries, as well as canned pears and fresh lemon juice and zest. The result was an awesome and flavorful apple crisp. I love freezing as many fruits as possible in the summer, because then you can be rewarded with comforting fruity creations such as this one in the winter. Finally, we had to have drinks! 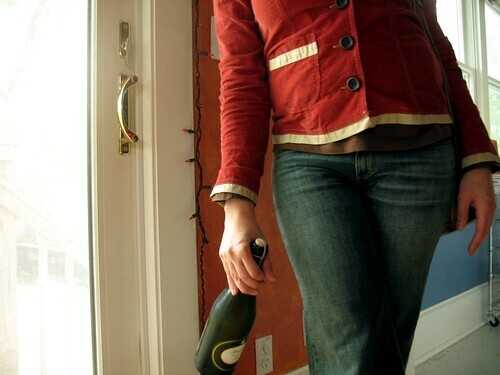 Usually, we drank lots of wine at our gatherings. However, it is worth noting that prosecco (a dry and mild Italian sparkling wine) also goes well with vegan feasts and cupcakes. 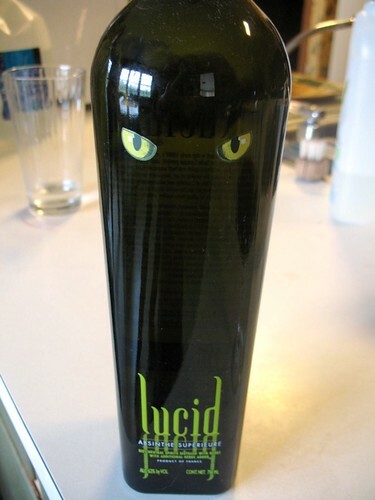 And, if an episode of Lost is particularly mind-blowing, there is nothing wrong with drinking some absinthe to add to the effect! Tonight is the season finale of Lost. This is a bitter-sweet moment for me. It is the last time we will see a new episode of the show before next February (! ), and it is the last of these weekly get-togethers with our awesome friends before we all scatter for the summer. This the last full day Daiku and I will be in Syracuse before embarking on our June travels. This semester would have been a lot less enjoyable had it not been for the good food and good company that we got to share almost every weekend while watching the weirdest of shows! After today, my posting will be sporadic, but watch here for updates from Virginia, St. Louis, Kansas City, and St. John! And for those of you watching Lost tonight, let's toast to each other- namaste! 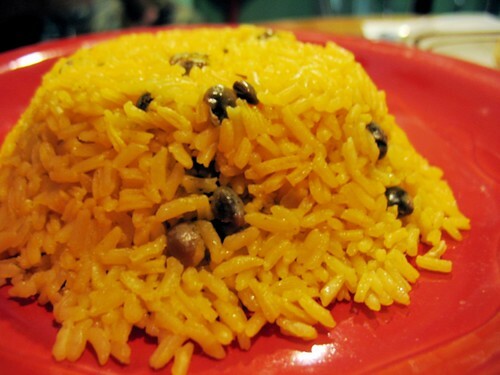 Puerto Rican and Pan-Caribbean food, plenty of vegetarian/vegan options. 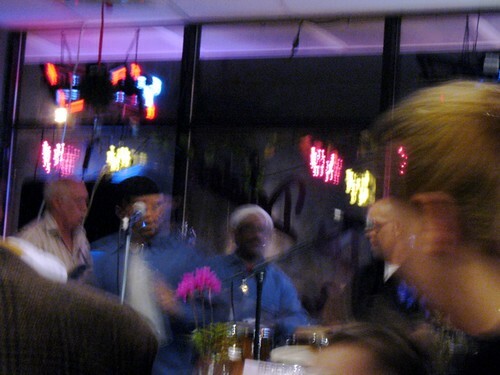 Read my previous post about Las Delicias, one of our favorite neighborhood restaruants. Right now, there is a chill in the air here and we have our heater on. It's a crying shame to have October-like weather in late May, (*shakes fist at Syracuse*) but at least we had some warm spells in the previous weeks. So having thought, however incorrectly, that summer was indeed upon us, Daiku and I did get to cook and eat some delicious warm-weather foods. First up, some more Yellow Rose tester recipes for Joanna. 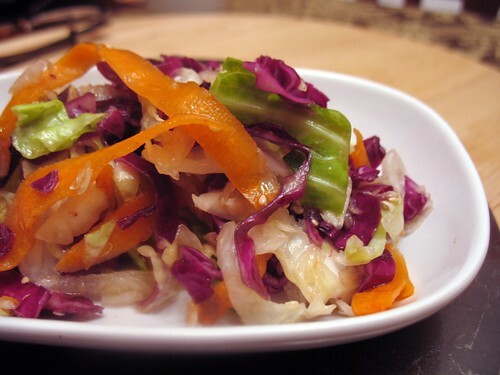 Above, we have a cabbage salad with a sweet sesame dressing. So much lighter and more flavorful than a run-of-the-mill coleslaw- I could eat this by the bucket! 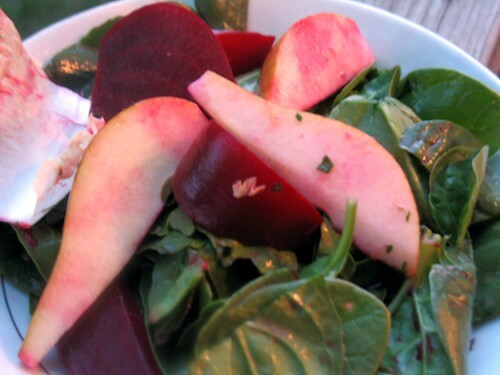 Next, we have a roasted beet and pear salad with a citrus-mint vinaigrette. I loved being able to use fresh mint from our mint plant that has survived for over 2 years! 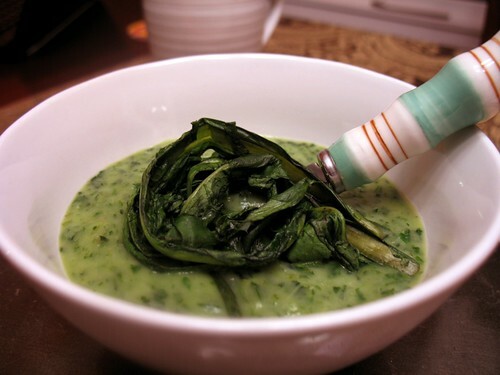 Next, we have a spring greens soup. I chose to use fresh dandelion greens from... our lawn! It is so fun to forage for food in your backyard, doesn't it? And since we don't use any chemicals in our yard or on our lawn, we can eat dandelions to our hearts' content, worry-free. 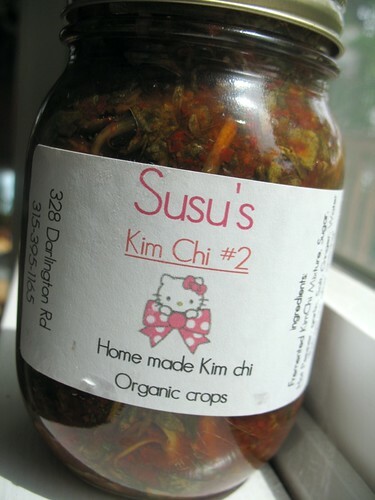 I love visiting the Susu kim chi booth at our local farmers market. Isn't that the cutest label ever? The jar you see pictured above is something that is new to me- watercress kim chi. But boy, is it good! It has a lighter and sweeter flavor than regular cabbage kim chi, and goes well with everything. The fact that it's vegan, local, and organic, adds to its awesomeness. 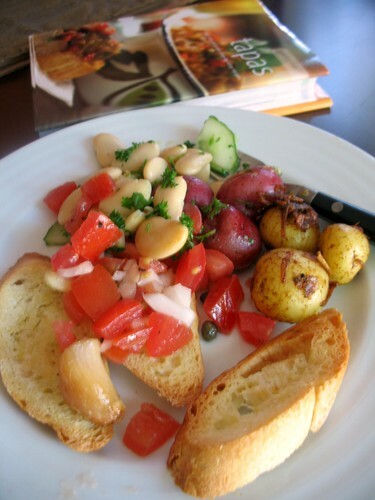 We picked up some veggies at the market and made the tapas spread that you see pictured above- tomato/caper salad, broad bean/cucumber salad, lemon parsley steamed potatoes, shallot spice roasted potatoes, and last but not least, crisp bread with roasted caramelized garlic to spread on them. We had this meal with a glass of sangria- pretty much the world's most perfect meal set-up, as far as I'm concerned! Finally, we have what Daiku and I call our "hippie meal." It's an arame-zucchini stir-fry recipe from the Natural Grocery Company website. 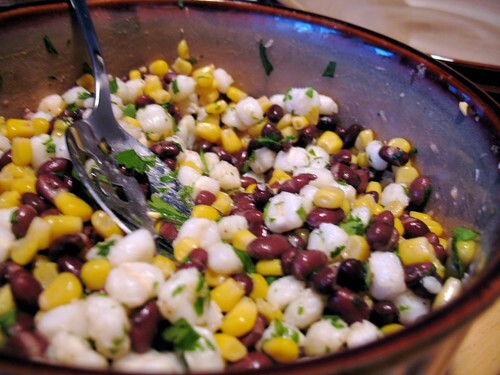 Whenever we feel a bit run-down, or want to eat something super healthy, we turn to this dish. 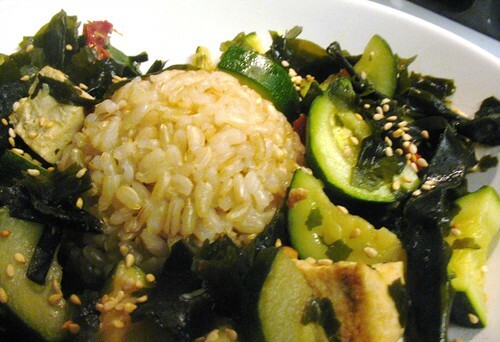 It's a simple stir-fry of tofu, zucchini, sun-dried tomatoes, and TONS of seaweed! 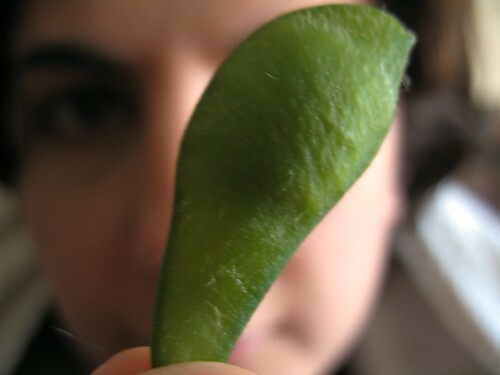 (We actually used wakame instead of arame, since that's what we had on hand.) Served with brown rice and a healthy sprinkle of sesame seeds, it's a nourishing meal. After you eat it, you feel full and yet light. The satisfaction carries over to the next morning. I'm usually ravenous for breakfast when I wake up, but not if I had this for dinner the night before. My hypothesis is that the seaweed is so full of minerals and nutrients that my body feels that it has everything it needs, and thus doesn't crave anything more! I don't know how scientifically sound this hypothesis is, but why don't you experiment and see if this meal doesn't nourish you the same way? Now, I'm going to go check on the thermostat. Brrr! I love baking bread. 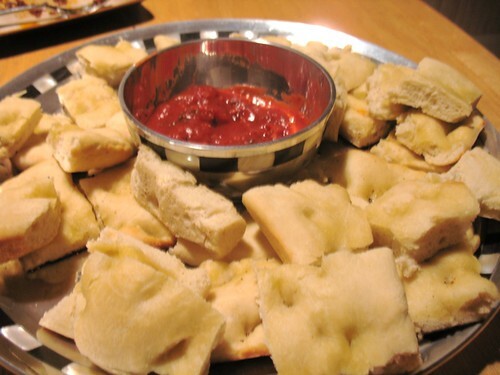 Everything from taking out your frustrations while kneading the dough to smelling the intoxicating smell of bread wafting from the oven is really exciting. However, all that work to make one loaf of bread, one loaf that often disappears in a mere day or two? Not so good. So, I decided to feed not one, but two big batches of sourdough starter and make not one, but three big loaves of bread last week! 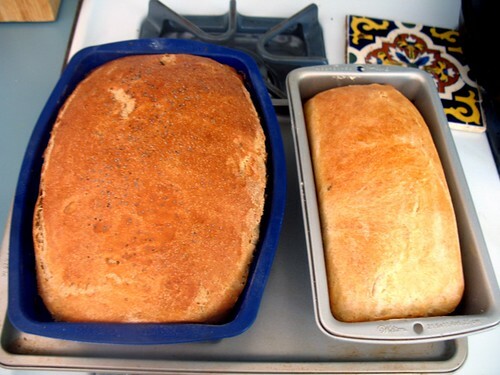 I decided to make two loaves of sandwich bread. As you can see above, the silicone pan expanded a bit! 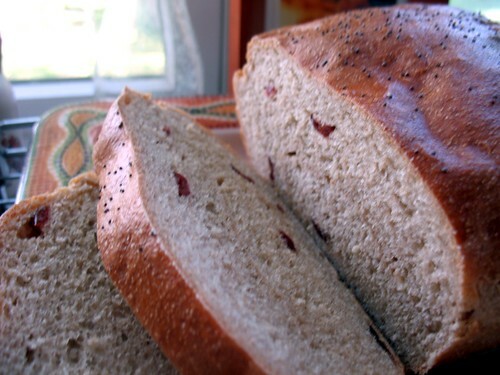 The bread on the left is a combination of white bread flour, rye flour, and semolina flour, with cranberries and a maple sugar swirl, topped with poppy seeds. The bread on the right is a combination of white bread flour, spelt flour, and rye flour, with raisins and a cinnamon/date sugar swirl. 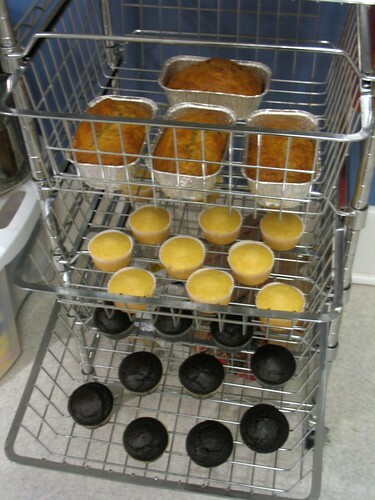 Here they are out of their pans and ready for the cooling rack. I was so happy with how they came out, especially because I improvised and didn't really follow a recipe. 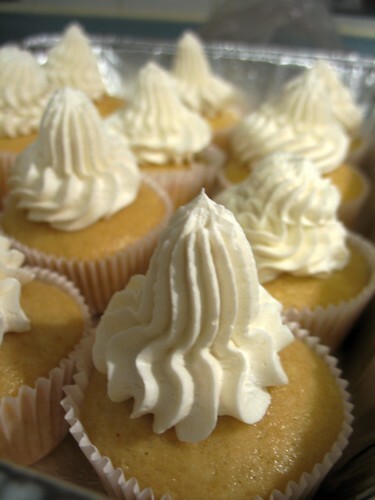 You'll notice my swirl skills need a little bit of work! 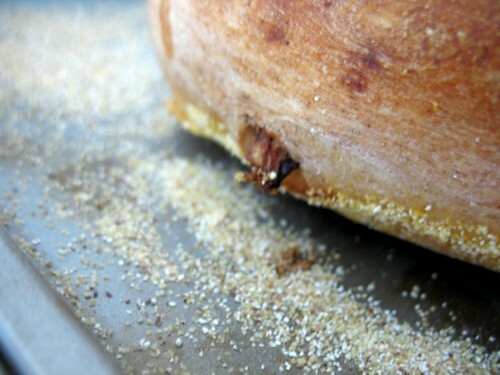 This bread still tasted great and made wonderful cinnamon toast. Ok, you can barely even see the swirl in this loaf! But it's there, I promise! The final bread was a free-form loaf, the same as the raisin bread above, but without the cinnamon swirl. 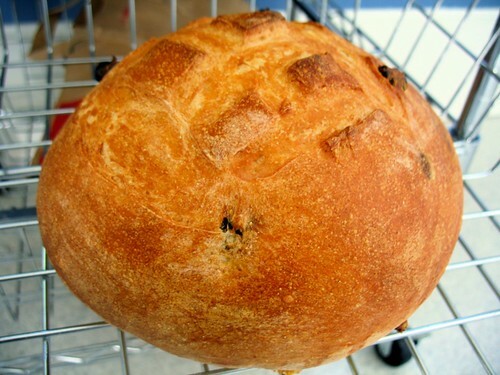 I love the combination of dried fruit and sourdough bread because the resulting bread is flavorful, but not too sweet, and perfect for sweet or savory uses. 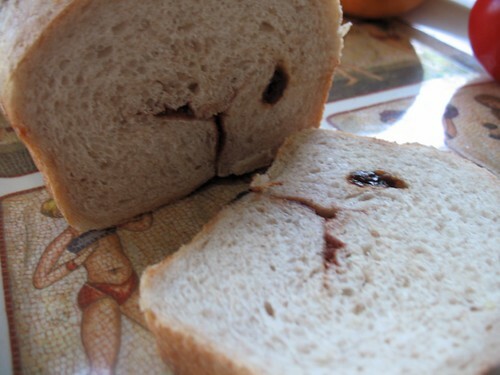 Here's an X-treme close-up of a raisin poking out of the bread. 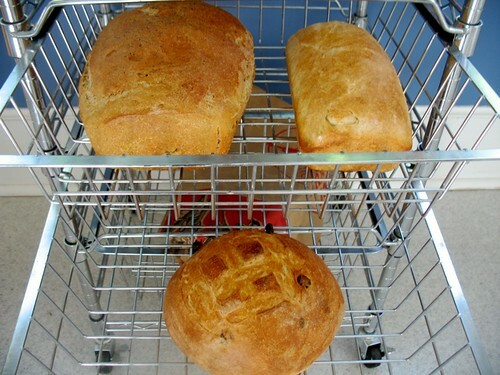 Baking multiple loaves of bread at one time is a great strategy. It doesn't take considerably more time or energy to make three instead of one, but you are left with a bigger payoff for that work. The great thing about sourdough is that it acts as a natural preservative, and so breads made with sourdough starter don't go stale as quickly. 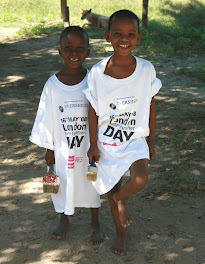 However, to keep them at optimum freshness (and to guarantee that we wouldn't finish them too quickly!) I sliced and froze half of each loaf. This makes for convenient toast at a moment's notice. It's also fun to experiment with ingredients and flavors. 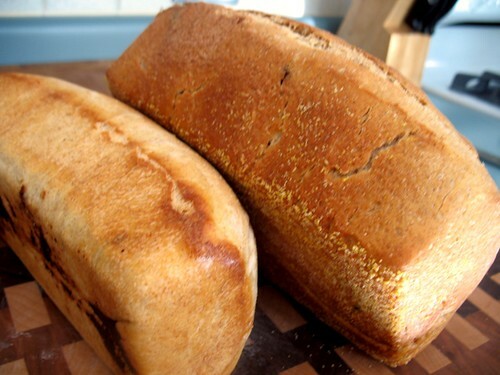 Next time you decide to make a loaf of bread, why not make two? Or more? 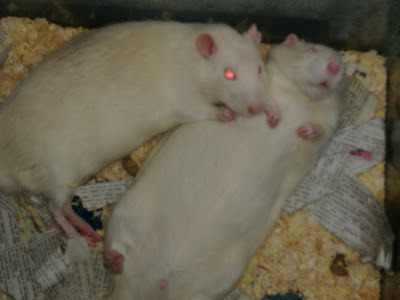 This post is for Catherine! I commented on her blog that I'd been baking a lot of muffins lately, and she came here and didn't see any. As usual, there's a lag between when I eat something and when I get around to blogging it, but I hope that she and all of you enjoy these muffins. 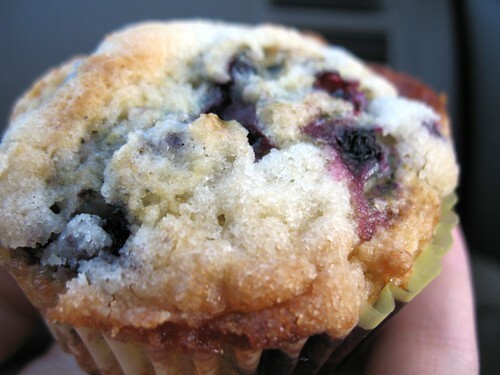 First, we have these blueberry muffins, the recipe for which comes from AmyArgh over on the PPK. (Here is the recipe- scroll down on the page. I left out the almond topping since I had none.) I was going to go shopping with a group of co-workers one day, and I wanted to get brownie points by baking everyone breakfast muffins. 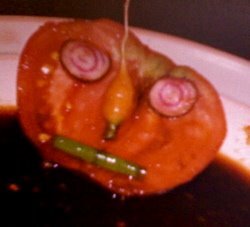 The recipe had to be suitably impressive, since I had a group of non-vegans to impress. 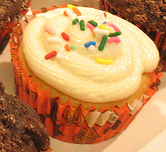 This recipe, with its professional bakery-style topping was a hit. All these decadent muffins were gone quickly! Pre-heat oven to 350. 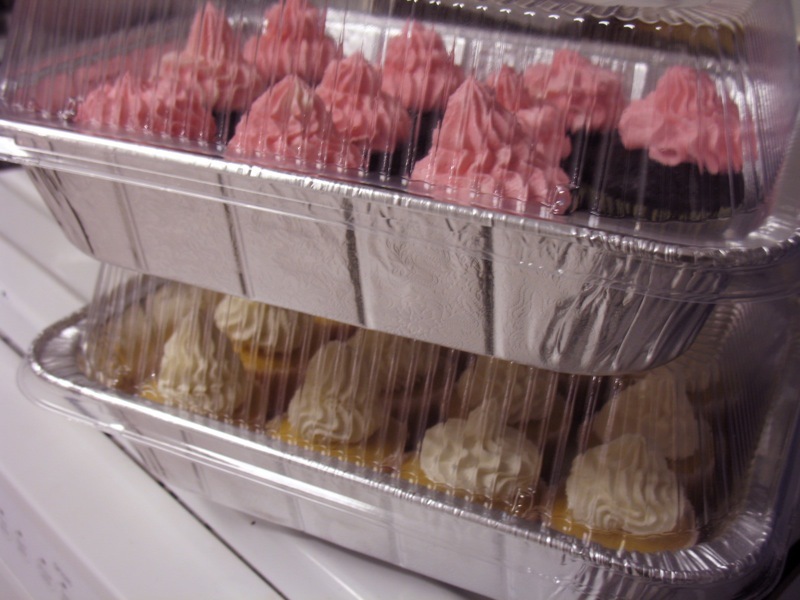 Line muffin pan with liners or lightly spray with oil. chocolate chips if you're feeling naughty! And mix until just incorporated. 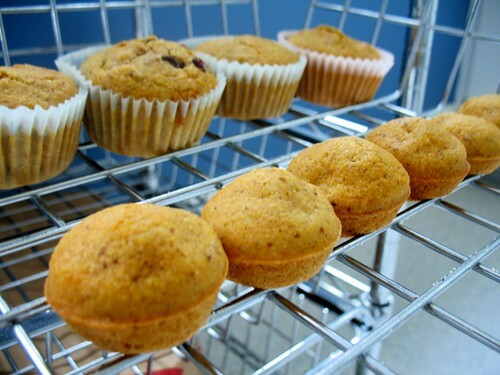 Fill muffin pan and bake 20 minutes for normal-sized muffins and 15 minutes for mini-muffins. (I baked these in my toaster oven, so you might have to slightly adjust oven temps and times for your oven.) 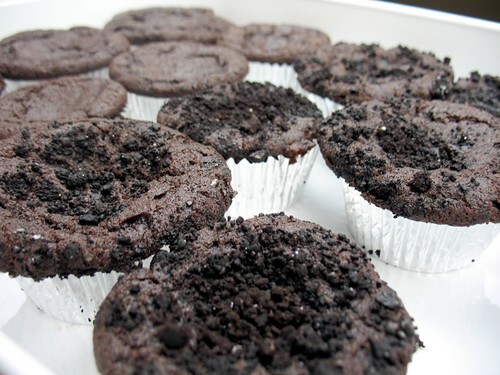 This recipe makes 6 big and 10 mini-muffins, or whatever combination of big/small you feel like! By the way, thank you all for your blog suggestions in my last post! I am slowly making my way to visiting all of them. In celebration of all this new-found blogging energy, I promise to blog every day this upcoming week, with lots of recipes and photos that I have backlogged! Just a quick product review for tonight. Since there are no Trader Joe's locations anywhere near where I live, I love going there whenever I'm traveling. While at my mom's last month, we decided to try their mixed olive bruschetta, a savory mixture of "black, brunettte and green olives with red peppers in olive oil." This stuff is, in a word, divine. It packs a salty and savory punch, and so a little goes a long way. 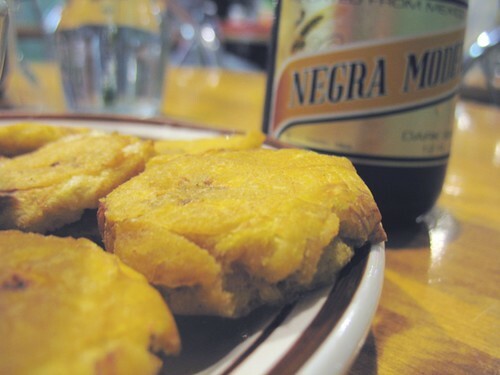 My favorite way to eat the stuff was as a topping for these crispy and flaky roti. 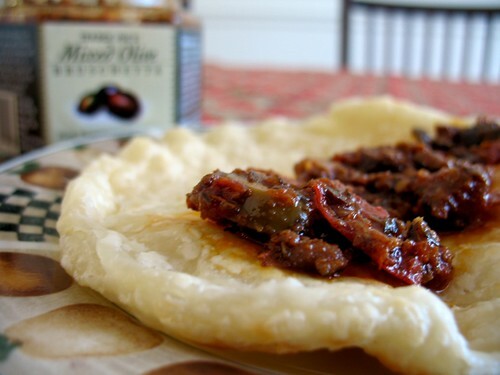 The buttery flavor of the bread complemented the piquant olives perfectly. 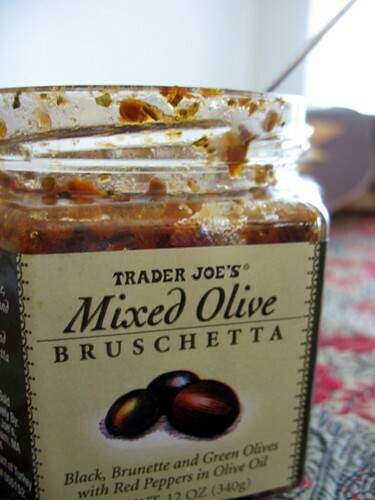 Trader Joe's has several types of olive spreads, and so far I have liked every one that I've tried. Summer is a great time to experiment with olive pastes, and I hope these ideas inspire you to try them out!